Drag and drop scheduling is something we, for example, take for granted as well as do so many of our clients, but as it would seem this is not as common of a feature you might think. Why is drag and drop so important you might ask? It’s simple. Resource management shouldn’t be an extra task you do just because it needs to be done. There should be a goal and a resource management software should get you to that goal. You should be able to get where you want to get without it being a tiresome quest through the wilderness of clunky features. You should save time with resource planning, not waste it. 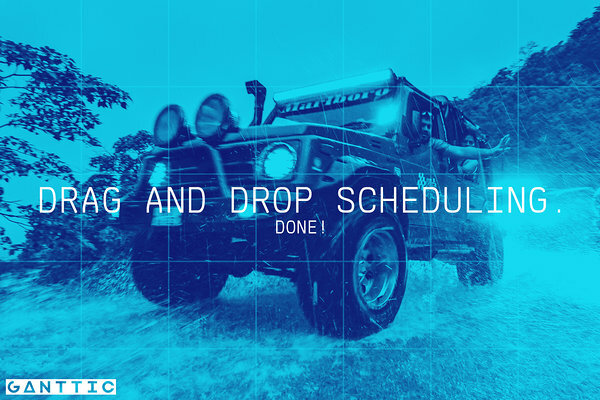 One of the things that makes resource management simple is drag and drop scheduling. Dragging and dropping is as easy as… well, dragging and dropping. Who has the time to submit numbers and intervals, when you could do it simply by two clicks or taps on the screen? Even though I see drag and drop as a must, there are some enterprises that do not. Not naming any names or pointing any fingers - what on earth are you doing? Do you not think of your customers and users? When talking about scheduling or planning of resources, one has to keep in mind, that in order to stay efficient, the scheduling and planning tool has to be able to actually help a person, not require additional time and effort. Don’t you agree? That is, in fact, the reason why we are not the biggest fans of any Enterprise Resource Planning software (ERP) - the ERPs are just too clumsy and cumbersome. In other words: they just need too much time and energy. There’s a huge learning curve to get things going. And even if you do get things going, things might still not be going anywhere since ERPs give you all of the details but not what you are really looking for - a quick and simple overview. We present Ganttic as the service that is the ‘fastest’ to manage anything. It’s not that I’m trying to sell this product (which I am), it’s the fact Ganttic is comfortable to use and granted, it may take some time to get used to it but trust me - the time spent will be worth it. Even a drag and drop scheduling software can have its' cons but the pros are definitely in the lead. One of the biggest pros is definitely the simplicity. And in the resource management software language, simple means fast. And since we are constantly feeling pressed for time, wouldn’t it be nice if something actually got done fast? You know what else is good about a drag and drop schedule maker? It’s not spreadsheets. Spreadsheets are difficult to manage, they create email noise, and important information still manages to go missing. Is something that inefficient worth your time? I’m thinking no. Ganttic has is the simple and comfortable (as simple as it can) interface - our existing track record and client base are just some of the part of the proof, that we are on the right track. Easy timeline navigation - using the calendar or just plain clicking left and right - makes it all even better. You can drag and drop Gantt charts to book resources for a year or for a day with a few clicks. Did we manage to sell you on this drag and drop software thing? Try Ganttic for free!